I recorded this ep in my closet. With my five-year-old standing outside the door, half-eaten cheese roll-up in hand. 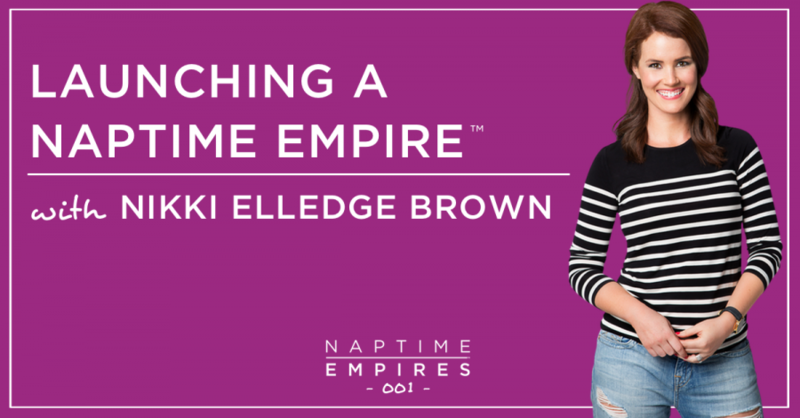 THIS is #naptimeempires life, my friend. We’re kicking off the show with MY story – which feels a little weird, not gonna lie, but when my buddy Morgan MacDonald proposed the idea – I knew she was onto something. I’ve shared my story on lots of OTHER people’s podcasts, so it makes sense to have a home base here on NE. Good to get it out there for you to chew on (so you can tell me what you’d like to know MORE about!). I’ll be the first to admit – the highlight reel sounds a bit online marketing-y flashy pants. How military wife + toddler mom went from making $14/hour to generating over $1 million in revenue in under 3.5 years. I genuinely have no idea where the next milli is coming from. I’m in a full on biz puberty transition phase right now, babystepping my way through divine inspiration, and I’m MORE than happy to share the messy, uncertain journey with you as I go. For today, though, I want to kick the show off with the FULL run down on how I made it to this point – from park ranger and part-time college professor making paychecks of the heart (i.e. not a comma in sight) to a Naptime Empire™ builder with a (much) bigger dream.